Just about any workshop experience is accompanied by a certain amount of nervousness. Palms sweat. Hearts beat a little faster. 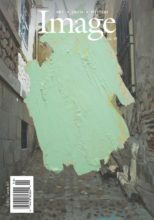 The truth is that when we present work for scrutiny and judgment we can feel an enormous amount of emotional stress and pressure. Because our workshop teachers and peers will examine our work carefully, we see them as an ideal—and formidable—audience. At the Glen Workshop, we espouse a vision of art that emphasizes discipline, excellence, and high standards, but we also want developing artists to receive the positive reinforcement they need to continue to grow in their craft. Furthermore, because our workshop takes place in a Christian context, we feel the responsibility to make sure this happens in an atmosphere of love. We, the Glen staff and faculty, understand that you make yourself vulnerable when you come to a workshop, and we work to make the environment at the Glen one of safety, understanding, honesty, and respect. Not everyone is looking for a workshop experience; for those, there are seminars. In a seminar, instead of practicing a craft during the week, you’ll be guided to experience art in the context of spiritual comradery. Everyone experiences some form of retreat at the Glen, but perhaps you want to go further. If you don’t want to attend a workshop or seminar, you can still come to the Glen as a “retreat attendee” and spend your mornings doing your own thing. Maybe you’ll write all morning. Maybe you’ll head out on the hiking trails. Maybe you’ll go into town or spend the time in contemplation. Or maybe you’ll sleep in! Whatever you need, the retreat option is here for you, and you’ll still be a part of the festivities of the afternoons and evenings. The Glen Experience: Newcomers from Image Journal on Vimeo. The Glen Experience: Community from Image Journal on Vimeo. 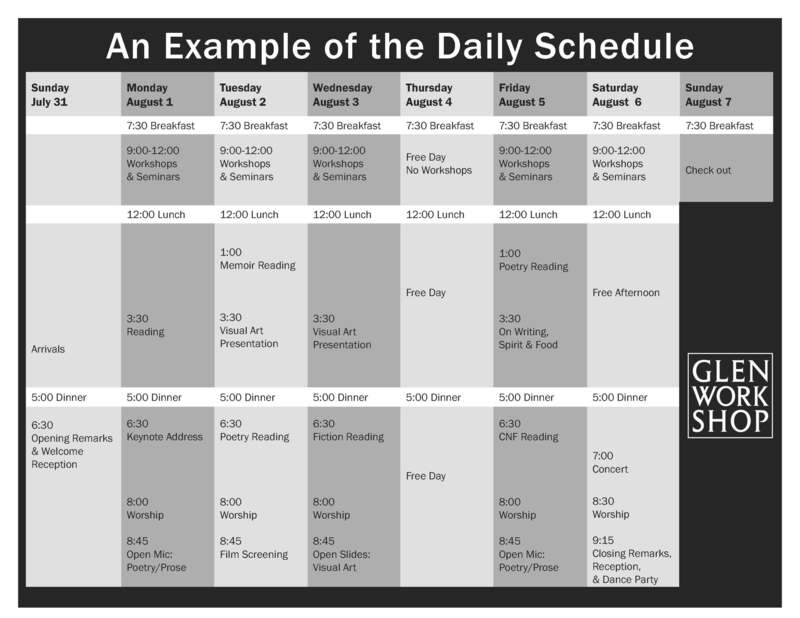 You can picture the event more easily by checking out this example schedule. 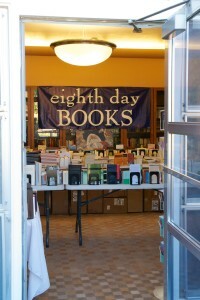 We’re delighted to welcome Warren Farha, owner of Eighth Day Books, to the Glen each year. Each summer he brings more books than you’d believe all the way from Wichita, Kansas, and creates a pop-up bookstore at the Glen. You’ll be able to buy books by the Glen faculty, as well as everything else that’s fit to read. 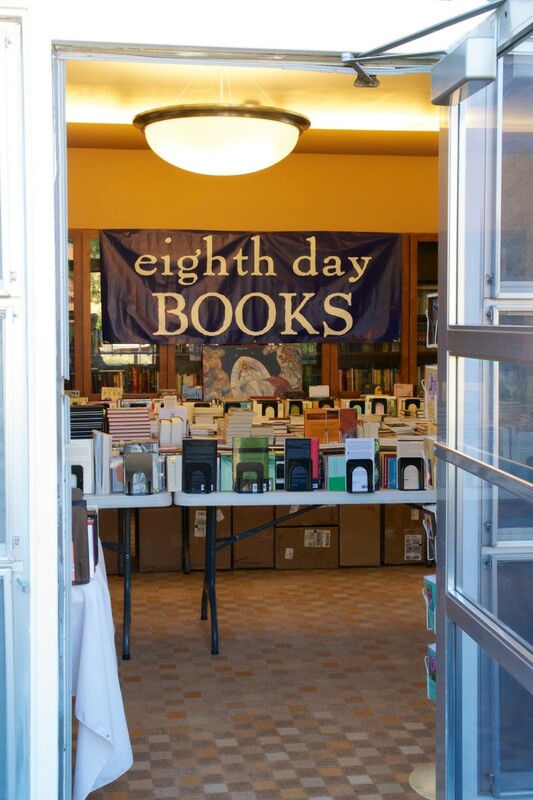 Though Warren himself would never say so, it’s our belief that Eighth Day is the bookstore of heaven. Though Image may look like a million bucks, we rely on small gifts for our very survival. 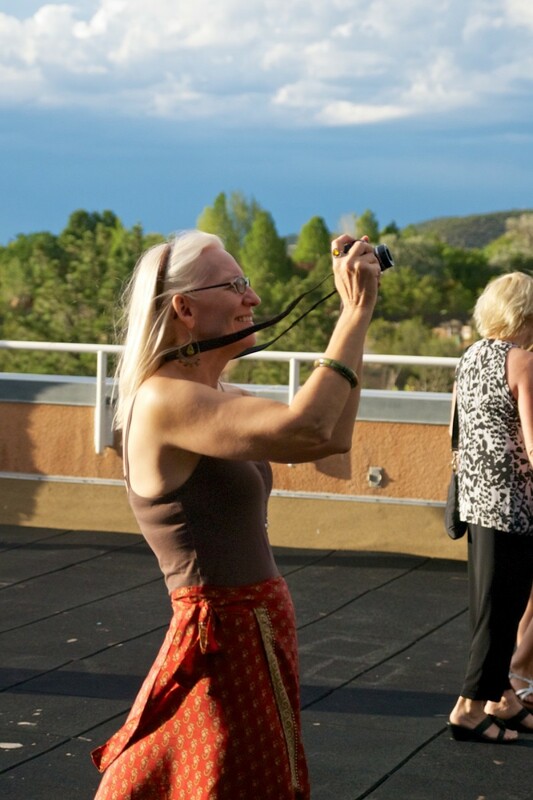 At the Glen we hold an auction of faculty and student work to help raise money for Image and show off the talents of our artists. The silent auction brings in over $5,000 in support each year. If you have work you’d like to donate to be auctioned, please bring it along. In any case, we encourage you to come prepared to bid! Just keep in mind that whatever you donate needs to be relatively small and portable.